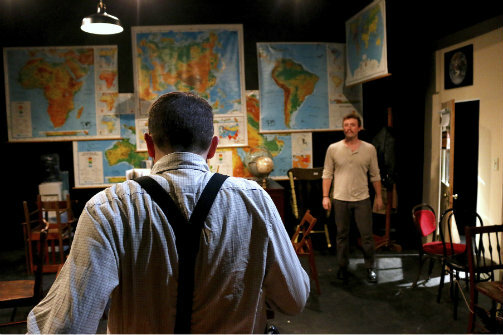 Chad M. Ryan and Daniel Clayton Smith in Lonely Planet. BOTTOM LINE: A beautiful play exploring friendship during the AIDS crisis. If you don’t know the play and its contexts, Lonely Planet was written in 1993, about a decade into the AIDS epidemic. In unpacking this tragedy for the stage, Steven Dietz wrote about two friends, Jody (Chad M. Ryan) and Carl (Daniel Clayton Smith), who struggle to stay afloat in a world full of chaos and death. That flow of chaotic energy, that sense of the struggle, convinces Jody, the owner of a map store, not to go outside. Jody's best friend Carl frequents his store daily, and resorts to different tactics to get Jody to face reality. Carl tells outlandish lies about his many jobs to entertain Jody—it's charming, until we learn the real reason for these stories. And in an effort to get Jody out, Carl eventually starts packing the already crowded map store with chairs…many, many chairs. Indeed, there are so many that Dietz eventually has to reference Eugene Ionesco’s The Chairs, an absurdist classic that likely served as inspiration for this somewhat more realistic piece. Dietz wrote these best friends and their world with great detail and a beautiful regard for their enthusiasms. As a maps enthusiast, Jody at one point describes his dying friends (AIDS is never explicitly mentioned in the play) as his "Greenland problem." He explains: in the common Mercator Projection map, Greenland looks almost as large as South America, when it is in reality much smaller. Jody explains this well before we find out he might be in danger of getting sick, but as we are learning he is too anxious to even attend his friends’ memorials. Jody's map metaphor serves as an acknowledgement that he is looking at his city and his life from a perspective that is not to scale—a perspective hindered by his growing agoraphobia. Although Jody and Carl are not romantically involved, their relationship feels not unlike that of the couple in The Chairs—marital, yet platonic. Fortunately, Ryan and Smith do not let this lack of romance prevent them from having palpable chemistry. But the actors feed off and compete with each other until they over-act their parts while trying to drive home the profundity of Deitz’s language. As Jody, Chad Ryan adorns himself in a physicality that is a decent match for Jody’s character—shy, reserved, petrified. But this physicality perhaps overshadows Ryan's attempts to imbue Jody with the fully realized anxiety the role seems to call for. In a sense, Jody's reserved personality feels more affected than lived in. Daniel Clayton Smith’s Carl is another kind of affected—the stereotypical gay man. Carl is fun and friendly, with a larger than life personality that feels even more out-sized in Jody's small store. Even though I liked Smith’s acting abilities, I still found him to give the same kind of over-achieving acting performance as Ryan. But given that both actors, clearly talented, suffer from the same issue, the problem may lie more in a lack of direction from Nick Brennan; perhaps this production would have benefited by a director who took greater control, rather than leaving the actors to their own devices. On it’s own, Lonely Planet is rich source material. In the canon of AIDS plays, this one sits up there in grand gesture next to Angels in America’s suspension wires. Jody’s detailed map store is decorated beautifully by Michael Harbeck. The Gene Frankel Theatre is already small and quaint; with many, many gorgeous maps throughout, plus all of the chairs carpeting the space, it’s a very crowded space to exist in—just like the play intends. The lighting is well done for the shop’s ambiance, but the sound design needs work. One of the sound cues, played whenever Jody has something prophetic to muse about in soliloquy, is an ominous tonal experience reminiscent of both Grey’s Anatomy and a skipping CD. The other choice—which Dietz wrote into his script—is Joe Cocker’s version of Bob Dylan’s "I Shall Be Released." While the lyrics describe well Jody's predicament, the song feels tonally wrong here, perhaps because of how it is used, or because it doesn't mesh well with the other music choice. Yet given these drawbacks, Lonely Planet is still a beautiful play, something this production both understands and is able to communicate. I highly recommend you go if you enjoy historical pieces that aren’t overtly rooted in political understanding. For above all else, Lonely Planet is about friendship, something that feels especially crucial in these times. Lonely Planet is by Steven Dietz. Directed by Nick Brennan. Set Design is by Michael Harbeck. Lighting Design is by David Palmer. Costume Design is by Timmy Schues. Video Production by Dale Thomas Krupla. Stage Management by Mariah Pepper, Kyle Fulton, and Kelbi-Caitlin Carrig. Associate Producer is Mallory Barrett. The cast is Chad M. Ryan and Daniel Clayton Smith.